Samsung is becoming more competitive as its rivals turn out to be more aggressive than ever. To maintain its throne as the biggest mobile vendor, the Korean tech giant has to keep up with other smartphone brands that are banking on powerful devices with a lower asking price. With this, the company promised to bounce back through its upcoming handsets. Samsung has already teased its Galaxy M series, but apart from this, a new device under its Galaxy A-line has appeared on Geekbench suggesting that they are also busy working on a premium mid-range smartphone – the Galaxy A50. The alleged Galaxy A50 recorded 1,693 points on a single core, while it got 5,031 multi-core score. The listing showed that it will pack 6GB of RAM, and might be powered by Exynos 9610 octa-core processor. It revealed that the device will run on Android 9 Pie out of the box, too. 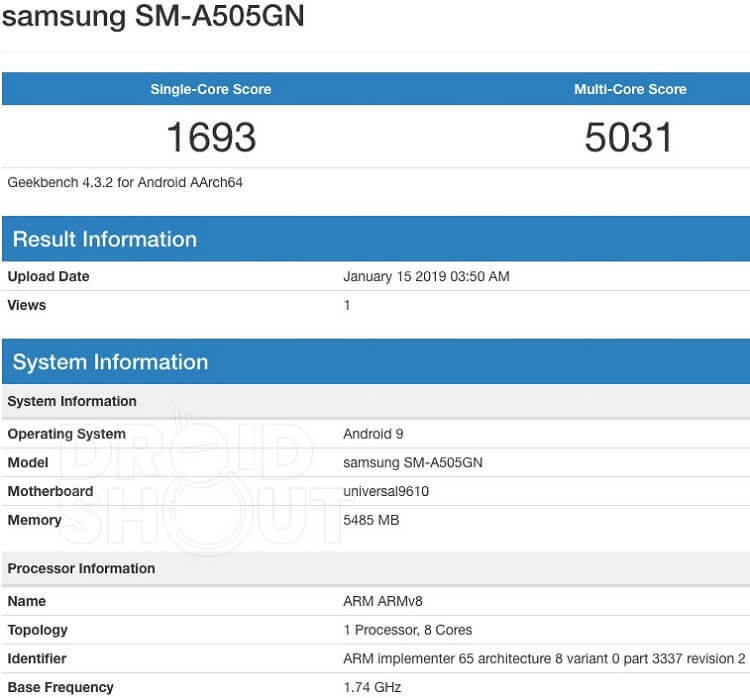 Meanwhile, the Galaxy A50 might also come with a toned-down model as it already appeared on Geekbench a month ago with just 4GB of RAM. If rumors are right, then, the Galaxy A50 will be offered with up to 128GB of internal storage, and a whopping 4000mAh battery. Rumors also suggest that it will be equipped with a 24-megapixel main camera, wireless charging, and in-display fingerprint scanner. We’ll update you as soon the Galaxy A50 goes official. So, stay tuned!